Sno Ball Brownies are a brownie version of the popular Hostess snack cake. 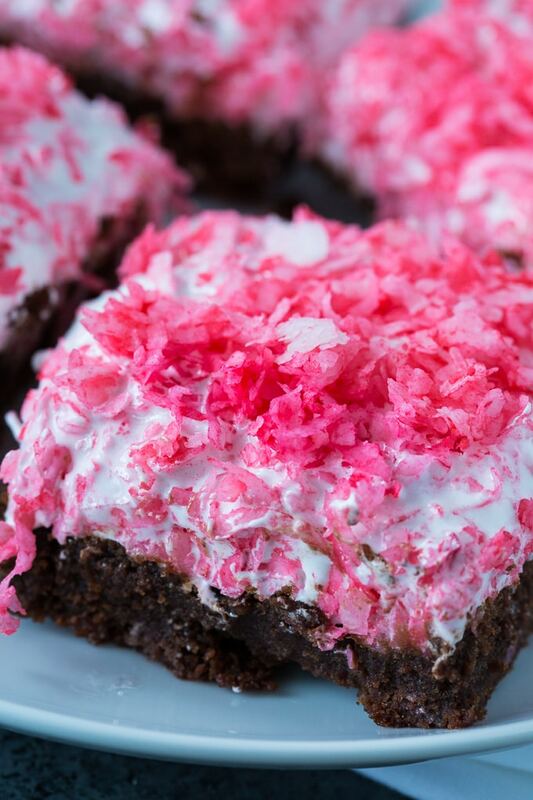 A rich, fudge brownie is covered in marshmallow fluff and pink coconut. These brownies are a festive treat for Easter. I grew up eating all kinds of Hostess and Little Debbie Snack Cakes. I don’t even know if Sno Balls are still available, but they rank right up there among the most memorable snack foods. 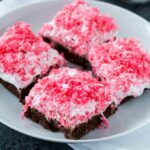 Chocolate cake is stuffed with white icing and coated in a marshmallow subtsance with lots of pink coconut. Nevermind if you can’t find Sno Ball snack cakes at the store. These brownies are even better. You can’t beat a rich homemade brownie smothered in a gooey frosting with lots of coconut. These Sno Ball Brownies are best stored in the refrigerator as the marshmallow fluff tend to get too messy at room temperature. Sno Ball Brownies are a brownie version of the popular Hostess snack cake. 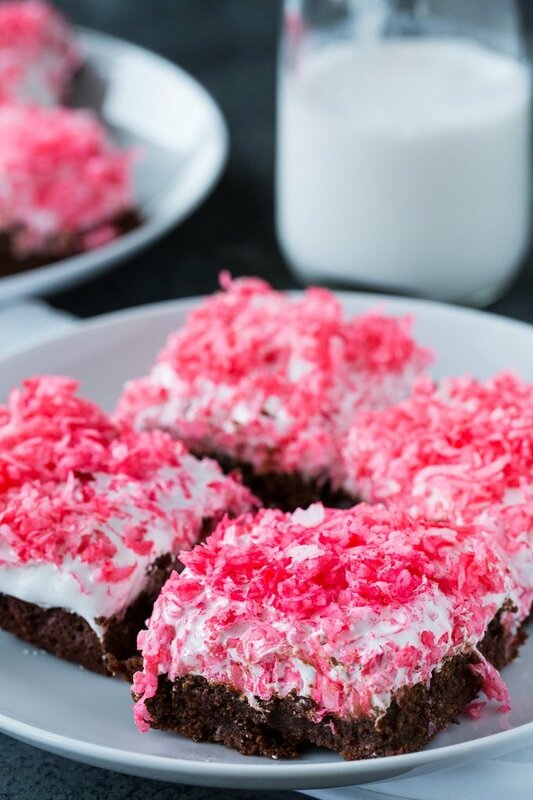 A rich, fudge brownie is covered in marshmallow fluff and pink coconut. Preheat oven to 325 degrees. Line an 8x8-inch pan with aluminum foil and lightly spray with cooking spray. Place butter and chopped chocolate in a medium saucepan over medium-low heat and stir until melted. Remove from heat. Stir in flour and salt. Spread batter in prepared pan. Bake for about 40 minutes. While still warm, spread marshammlow creme on top. Place coconut, cornstarch, and food coloring in a food processor and pulse until the coconut is chopped up some and the pink color is evenly distributed. 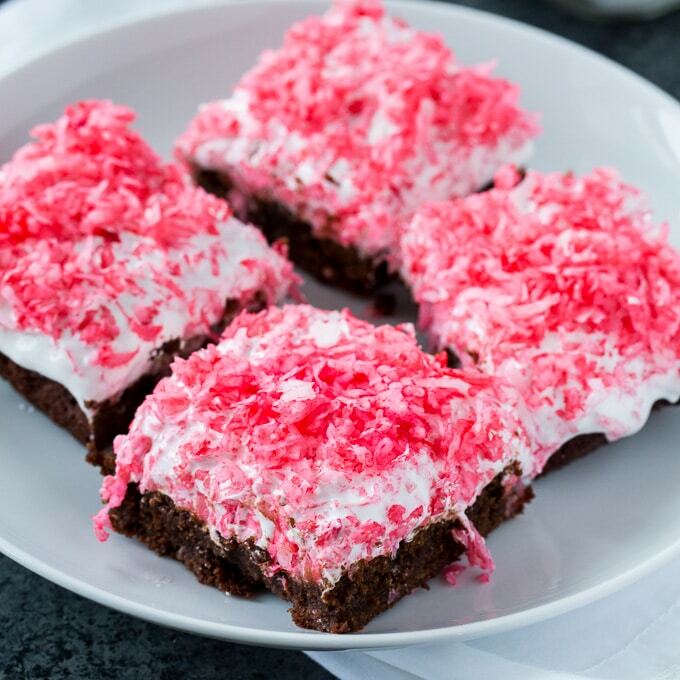 Sprinkle pink coconut on top of brownies, pressing it into the marshmallow creme. This entry was posted in Brownies and Bars and tagged brownies, coconut. Bookmark the permalink. When I was a child (in the 1950s), my mom would give me 10 cents every day to spend on a treat from the little grocery stock down the corner in Brooklyn. That 10 cents was spent on Sno Balls, Twinkies, and Devil Dogs. And, yes, Sno Balls are still available! If for nothing else, get them for nostalgia’s sake. But I think your recipe is a healthier version (goodness knows what’s in the commercial product). I still pick up Devil Dogs whenever I see them, stick them in the freezer, and eat one straight out of the freezer. They are like eating an ice cream sandwich.